This is a great opportunity for young farmers, particularly those who might want to farm in urban areas. And there is still time to sign up for the January training! Growing Power’s founder and CEO, Will Allen, was recently awarded a MacArthur fellowship. “Growing Your Community Food System” is an intensive, hands on, training workshop offering diverse groups the opportunity to learn, plan, develop, operate, and sustain community food projects. Project participants leave the workshop with improved skills that they can take back into their communities and pass on to others. These workshops are for both rural and urban projects. This training is at the Growing Power facility in Milwaukee, WI. Aquaculture/Aquaponics: Build an indoor system for raising fish. Recycle the wastewater from the fish and grow plants. This is known as aquaponics. See us grow Tilapia at a very low cost. Learn how to build indoor fish and plant systems for food production. Participants will set up a small scale Aquaponics system and learn how to maintain and monitor tilapia fish production in a closed loop/natural system. Bee Keeping: Learn the ABC’s of urban or rural beekeeping without the use of chemicals. Participants will leave with a solid understanding of the materials, suppliers and environment to keep these amazing animals content and productive. Community Project Design: Develop effective action plans for your food system project. Meet people who have actually done community projects requiring technical expertise in soil remediation, urban agriculture & food distribution, aquaculture, vermiculture, community gardening, large or small-scale composting, bee-keeping, etc. Living Biological Growing Systems: An Innovative Approach to Sustainable Production. Learn how to develop a comprehensive and sustainable growing system that can grow food year-round without heat. Composting: Learn how to build indoor/small scale compost systems, and design and maintain outdoor/small and large-scale systems. Discuss collection of waste streams in the city or on the farm. Hoop House Construction: Hoop houses are a great season extender whether used for early tomatoes or year round greens. They are extremely adaptable and can be inexpensive to maintain. This workshop will demonstrate how to bend pipe to make hoops, how to erect and secure the hoops, how to finish the ends as well as pull the plastic. We will also discuss strategies for utilizing the structure. Year Round Production and Marketing Workshop: Participate in a group discussion focused on year-round greenhouse production and marketing strategies to effectively sell your product. 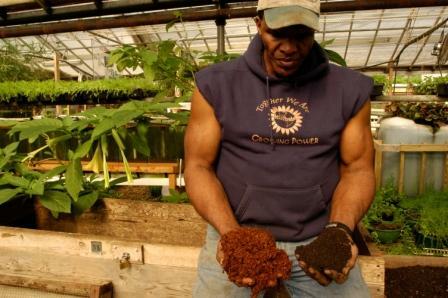 Get hands-on training to learn how to mix soil, seed, harvest, wash and package sprouts. Take home some finished product to share! Animal Health- Learn the proper breeding, nutrition, and environment for your animals. Develop your custom strategic plan to select which species most ideally fit together in your individual set of circumstances. Other workshops may include: Dismantling Racism and multicultural alliance building, Record keeping/accounting/human resources and legal risk management, Mushroom growing, Youth programs and soap making, and cheese making.